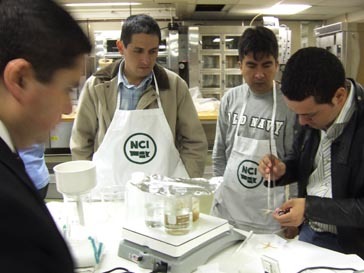 Twenty-four participants from Chile, Colombia, Peru, and United States are attending the Pasta Production and Technology Short Course that runs from April 14 to 16 at Northern Crops Institute (NCI), Fargo, N.D. Through pilot-scale exercises, the course participants directly apply what they learn in the lectures and laboratory during the pasta extrusion process. Our pasta course is one of the oldest courses that we offer here at NCI, says John Crabtree, NCI Assistant Director. It's a natural since Minnesota, Montana, North and South Dakota, the four states that we represent, produce 75-80% of U.S. durum. Durum is the key ingredient in excellent pasta. 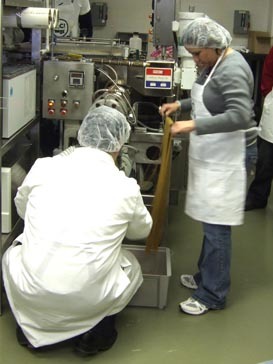 The traditional pasta companies have typically participated in these courses. Now, we are seeing other food companies that either offer pasta products or are looking at developing new pasta products. The participants come to learn more about the process of making pasta, how other ingredients can be added to pasta, and to look at the new pasta technology. U.S. Wheat Associates is sponsoring six participants from Chile, Colombia and Peru. Typically in South America, pasta companies have used wheat other than durum for pasta products. However, several companies are now beginning to use more durum for some of their specialty products, says Crabtree. One of the participants from Colombia commented that their pasta sales have been very good. The price for pasta products is very reasonable compared to many food products. In the U.S., after the low-carb crisis and now with the introduction of whole grains and other ingredients, we have seen a tremendous consumer-driven growth in U.S. pasta sales. Lecture topics include durum varieties, quality evaluation, durum milling and semolina quality, wheat quality tests, functional and alternative pasta ingredients, semolina physical and rheological tests, commercial pasta production, impact of protein and starch on pasta quality, state of the industry, pasta die design, pasta drying technology, extrusion equipment, pasta color and cooking evaluation, quality assurance, fresh and frozen pasta technology, causes and solutions of pasta defects, and whole grains update. The class toured Philadelphia Macaroni Company, Grand Forks, N.D., on Wednesday. 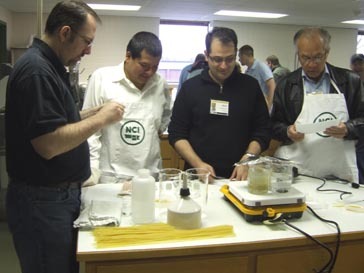 Course faculty and technicians are: Gabriele Cannata, De Mari Pasta Dies USA; Michael Ehr, Buhler, Inc.; Bruno Giberti, Axor America, Inc.; Radwan Ibrahim, Ph.D., Dakota Growers Pasta Company; Thunyaporn Jeradechachai, NCI Crop Quality Specialist; Frank Manthey, Ph.D., NDSU Professor of Plant Sciences; Rilie Morgan, NCI Processing Specialist; Brian Sorenson, NCI Director; Stan Stancyk, NDSU Dept. of Plant Sciences; Mehmet Tulbek, Ph.D., NCI Technical Director; and Mark Vermylen, A. Zerega's Sons. 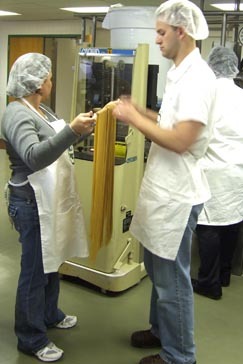 A second pasta short course, Pasta: Raw Materials and Processing Technology, will be offered July 20-24, 2009. The 2008 U.S. Durum Quality Report states that last years U.S. northern-grown durum crop boasted very low levels of damaged kernels and high average protein with a slightly higher test weight than the 2007 crop. USDA/FAS reports the five largest importers of U.S. durum in 2008/09 are Italy, Nigeria, Algeria, Costa Rica, and Venezuela.